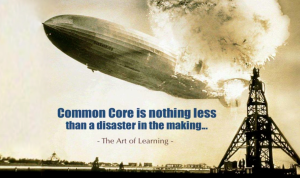 Observations about high stakes testing from an American teacher who is teaching in a University in Japan. I’m a full-time University teacher, living and working in Japan since 1994. We had our entrance exams a few weeks ago, and part of the job for University teachers here is to mark certain sections of the tests by hand. One of the things I notice each year is that most Japanese students get 30 to 50% of the answers wrong. Just a bit mathematical ! The way I have presented it is showing how mathematicians think. Get an idea, try it out, if it appears to work then attempt to produce a logical and mathematically sound derivation. The idea is that wherever you have operations on things, and one operation can be followed by another of the same type, then you can consider the combinations of the operations separately from the things being operated on. The result is a new type of algebra, in this case the algebra of rotations. and then HH = I, where I is the identity or do nothing transformation. So what is Q ? and let its value be called k.
What we can be fairly sure of is that k does not multiply each of the coordinates. This appears to be meaningful only for the normal numbers. At this point it helps if the reader is familiar with extending the rational numbers by the introduction of the square root of 2 (a surd, although this jargon seems to have disappeared). If we plot this and the other rotation numbers as points on a coordinate axis grid with ordinary numbers horizontally and k numbers vertically we see that all the points are on the unit circle, at positions corresponding to the rotation angles they describe. OMG there must be something in this ! ! ! ps. root() and sqrt() are square root functions, and sqr() is the squaring function . pps. Diagrams may be drawn at your leisure ! This is a link to a post by WatsonMath about Stanford Professor Jo Boaler and her thoughts, opinions and research backed statements of the counterproductive combination of “learn your tables” and “take this (yet another !) timed test on them”. Definitely worth reading, and worth passing on as well. 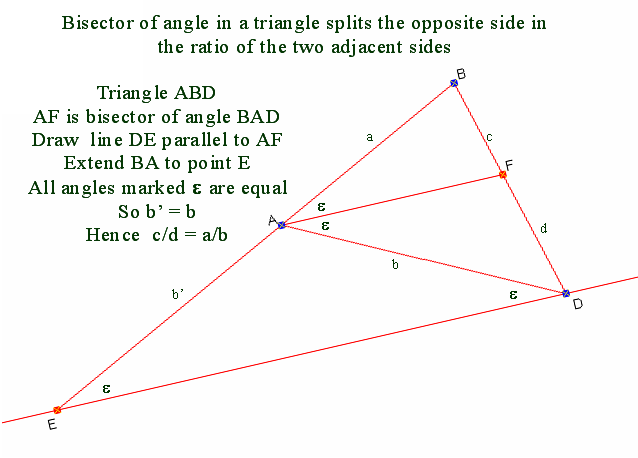 To show that the angle bisector of an angle in a triangle splits the opposite side in the ratio of the two adjacent sides. I used to not give answers to my engineering students. They hated me ! When i pointed out that if they ever got hired it would be because the firm had problems to be solved, and they DIDN’T have the answers. together with comments from Joseph Nebus and myself.